Most people are familiar with Malala by now, her story has been seen on many news outlets, but in case you haven't heard of her, she is a young girl that stood up for the freedom of young girls to go to school when the Taliban took over her town. She lived in Northern Pakistan in the Valley of Swat. I'll say this now, there are some controversies about the legitimacy of some of her claims, however, I am going to purposely choose to believe what she says. I am not nihilistic enough to discount things that a young girl talks about in a memoir. There are two main reasons why I really enjoyed this memoir. The first reason is because it gave me a more clear understanding of what it means to be a traditionalist Muslim, progressive Muslim, and a radical(Taliban) Muslim. I would consider Malala's family to be a more progressive Muslim family. They respected their traditions but they also fought for more freedoms when it came to the females in their family. There were others around Malala's family that were more traditionalist Muslim and some within her family too. Malala's mother was more traditional than progressive in my opinion, at lease more so than Malala herself. Regardless of traditionalists vs. progressive in this area of the world, their beliefs were extremely important to them. Then we have a more radical interpretation of Islam that the Taliban introduced into the Swat Valley. As readers, we come to understand the varying differences of Islam in each of these groups of individuals through the eyes of Malala and I think this is important to understand for people in the Western world. The second reason I really liked this memoir is because it showed the propaganda usage that the Taliban used to create a foothold in the Swat Valley. First, the Taliban set up a radio station that broadcasted twice a day to the people in the Swat Valley. The radio programming became popular as it talked about fundamental Muslim beliefs. Over time, the radio station started to implement more radical thinking into its broadcasts and used political circumstances to spread a stronger message. The next step was the praise of "good" Muslims and the admonishment of "bad" Muslims. No one wanted to be listed as a bad Muslim because everyone was listening to these broadcasts. No one wanted to be a bad Muslim and go to hell. Rights of women started to be taken away and if the women agreed they would be praised as a good Muslim woman. This led to clothing being restricted to certain garments for both genders, banning of anything "Western", and eventually girls being banned from going to school. I just have always had a fascination with how propaganda works and this was all fascinating to me. I definitely recommend this memoir for people that want to get a different viewpoint on Islam from the eyes of a young girl. 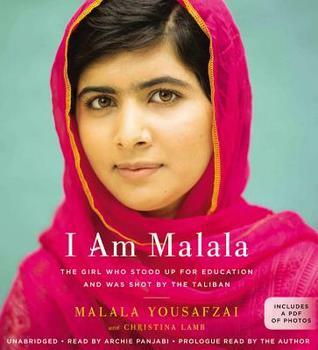 Sign into Goodreads to see if any of your friends have read I Am Malala. 30.0% "Interesting culture study of tradition vs progression"